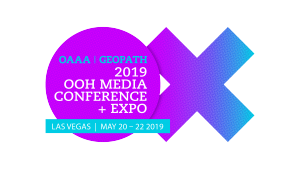 The OAAA has announced that a panel on direct-to-consumer (DTC) marketing and advertising has been added to the mainstage programing at the 2019 OAAA\Geopath OOH Media Conference + Expo, being held May 20-22 at the Aria Resort in Las Vegas. According to a new study from the Interactive Advertising Bureau (IAB), the future of retail growth comes from direct consumer relationships. Online channels drove more than 90 percent of growth in consumer-packaged goods in the last year. 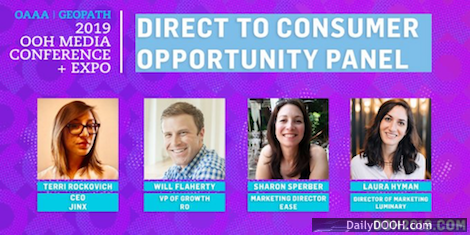 The Direct-to-Consumer Opportunity panel will discuss the challenges of marketing DTC businesses and advantages of using OOH to building brand awareness. This entry was posted on Thursday, March 7th, 2019 at 04:22 @224 and is filed under DailyDOOH Update. You can follow any responses to this entry through the RSS 2.0 feed. You can leave a response, or trackback from your own site.